What’s It About? ’71 follows a young soldier, Gary Hook (Jack O’Connell), who is deployed to Belfast during the civil unrest in Northern Ireland during the 70s. 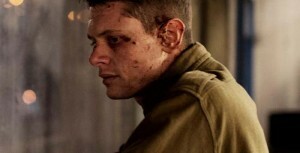 Following a riot on the streets, from which he barely escapes with his life, Gary finds himself lost and disoriented after being accidentally abandoned by his unit. The journey back to his barracks is not a safe one and there is a lot of conflict that he must avoid in order to stay alive. Verdict: Ever since starring as Cook in the second generation of Skins all those years ago, Jack O’Connell has proven himself to be one to watch time and again. Following his critically acclaimed performance in gritty prison drama Starred Up, O’Connell has taken the lead in ’71, and gives yet another stand-out performance. Carrying the film with an intensity and strength, ’71 should cement O’Connell as one of the up and coming actors to watch. Although the film was strong throughout, mostly thanks to the incredible performances, it is somewhat underwhelming when it comes to content. 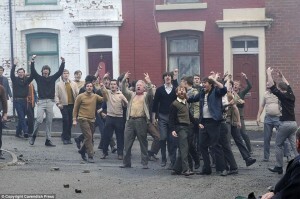 ’71 can definitely be applauded for providing an interesting insight into a period of British history which normally goes unnoticed in cinema, however, much of the film follows Gary through just one day and night on the streets of Belfast. Although O’Connell’s performance is solid, he has a penchant for playing characters of little words, and he doesn’t actually have many lines in the film. Which is quite a feat for the main character. Gary is an intriguing character to watch but sometimes the silence becomes a little bit tiresome as you urge for some dialogue to gain a wider understanding of who he is and what he’s feeling. As the film progresses it also appears to become slightly more far-fetched; going from a gritty and hard-hitting depiction of the Irish riots to a slightly bizarre revenge flick, with some of the characters proving to be confusing and their motives unclear. The ending also seems slightly rushed, adding to the underwhelming flavour, but thanks to the strong performance from the leading man you’ll leave the cinema more disappointed that the film didn’t quite reach its full potential rather than anything worse. Final Words: A strong concept made stronger thanks to Jack O’Connell’s stand-out performance, but unfortunately ’71 lacks the depth required to leave a lasting impression. The plot of ‘71 provides a brilliant opportunity to explore an under-acknowledged part of British history but it seems to only be a half-way attempt, with the basic storyline becoming muddled towards the end as the filmmakers struggle to stick to one kind of genre. ’71 is in UK cinemas on 10 October 2014.